​I'm Stan Dubin, ​and I've been helping companies hire better staff for the last nine years. After writing 180 articles and delivering 200 podcast shows on hiring, I put my best material into a book. How many times have you interviewed someone and a few weeks down the road you discovered this person was NOT the person you interviewed? How much should you rely on the résumé? Which is more important: skills or attitude? What if someone you’re interviewing rubs you the wrong way…but you think they’ll do a good job? With 65 chapters, these questions and many more are answered. 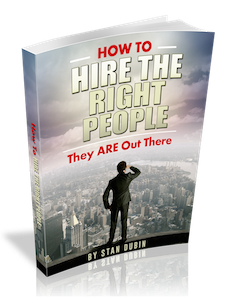 You'll learn how to screen out people you do not want and hire the people you do want. "Excellent book! I wish I had read this when I started my first company. This book was an eye opener for me. One the my favorite takeaways from this book are the interview questions that can reveal so much about the person's attitude and work ethics. Takes much of the guess work out of hiring and firing. I would consider this to be a bible." "Often times these types of books all say the same thing. This one doesn't. I actually took notes and screenshot some pages in order to write up my hiring 'hat.' I have been hiring and interviewing for 20 years with varied success. I have been using an applicant testing kit for 12. This adds more great stuff."